AMERICAN FORK, Utah – Bee Stinger, a leading manufacturer of archery hunting and target shooting bow stabilizers, weights and mounting hardware, announces the new Sport Hunter Counter Slide and Sidebar Infinity. These new products provide unmatched balance and accuracy for archers. The new Bee Stinger Counter Slide offers limitless configurations for archers to customize their optimal balance, whether they are hunting or target shooting. Achieving perfect balance and offsetting the weight of a sight, quiver and other accessories has never been more accurate, adaptable or simple. Five individual one ounce weights and sliding bracket allow for minute adjustments to achieve perfect balance. The Counter Slide allows additional weight distribution forward and back of the riser and is available in 10-, 12- and 15-inch configurations. The new Sidebar Infinity allows archers to adjust their bar settings in a range as infinite as they are exact. Engineered and machined for infinite two-axis adjustment, the laser engraved alignment marks make viewing, tuning and noting your settings easy and fast. The built in quick disconnect makes for fast, rock-steady attachment and detachment on the fly. Attendees of the 2017 ATA Show in Indianapolis are encouraged to visit the Bee Stinger booth (#2517) to try the Sport Hunter Counter Slide and Sidebar Infinity in the shooting lane and learn more about the latest products offered by Bee Stinger and sister company Gold Tip. Bee Stinger staff will be on hand throughout the show from January 10-12. Bee Stinger, a Vista Outdoor brand, is a leading manufacturer of archery hunting and target shooting bow stabilizers as well as mounting hardware and weights. 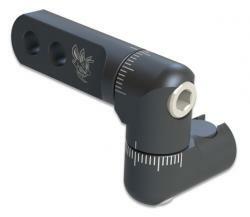 Bee Stinger stabilizers are engineered to deliver the advantages your bow needs to achieve its peak performance. For more information about Bee Stinger products visit www.beestinger.com.